The great Czech scientist Jan Evangelista Purkinje (1787–1869) maintained that visual illusions reveal visual truths. However, the illusions he was referring to were not the geometrical optical illusions described later in the century but the apparent distortions in patterns like concentric circles. Purkinje’s portrait on the cover of this edition can be dimly discerned in the circles: his left eye is at the centre of the pattern and he is shown in three-quarter profile. His face can be seen by defocusing the image, shaking the head or viewing the circles from a distance. Many images like this can be found in my books Visual Allusions and Art and Illusionists. The 19th century was the age of visual illusions. Concern with confusions of colour, contour and motion can be traced to the ancients, but the pace quickened after 1800. Initially the illusions of interest were those visible in the natural environment, like the waterfall illusion, the apparent motion of the moon when clouds pass by or the ambiguous direction of motion in windmill sails seen from afar. In the domain of colour, practical problems of fabric dyeing resulted in formulating laws of colour contrast. All was to change with the invention of photography and of instruments that presented paired pictures or sequences of slightly different ones. Thereafter, pictures permeated perception, transforming its study by transferring it from the natural environment to the laboratory. The nature of the transformation had two phases: in the early 19th century concern was with simulating in the laboratory what was visible in the environment – depth and motion. In the second half of the century illusions became simpler and divorced from the external world. Geometrical optical illusions involving line drawings inducing small spatial distortions, like those in Figure 1, were the order of the day. Figure 1. Illusions of vision by Nicholas Wade. All the lines defining the words are vertical but those for VISUAL appear to be tilted in the opposite direction to those for ILLUSIONS due to the background orientations. Colour assimilation is also evident as the yellow background is physically equivalent throughout. They were then, and remain, fascinating to look at, and many variations were described often bearing the names of those who drew attention to them. Now, with the advent of computer graphics their number has expanded enormously and a multitude is assembled in The Oxford Compendium of Visual Illusions (Shapiro & Todorovic, 2017). I will describe motion and spatial illusions from the early phase before introducing those given the name ‘geometrical optical illusions’. What are illusions? They can be considered as errors in perception, and as such they were remarked upon before the basic perceptual processes were either described or appreciated. This was so because it was possible to compare observations of the same objects over time and to note any discrepancies between their perceptions. The modern definition of illusions applies to differences between the perception of figures and their physical characteristics, and they have been gauged by many means. The most venerable method has involved the comparison of percepts: when an object’s properties appear to differ under different circumstances, then an illusion is said to have occurred. The only assumption that needs to be made is that the object has not itself changed between the two events. The 19th century witnessed an explosion of experimental ingenuity in all areas of science. The senses were at the centre of many of the dramatic departures, and the experimental advances in turn influenced theories of perception generally and illusions in particular. For example, perplexing percepts like the apparent bending of sticks when immersed in water could be given a more mundane interpretation when the laws of refraction were specified. Early in the century instruments were invented that not only extended the phenomena that could be investigated but also enabled their study in the laboratory rather than in the natural environment. What is truly remarkable is that the seeds of the transformations of visual space and time were sown in the same geographical space and at around the same time: London in the 1830s. Figure 2. London visionaries by Nicholas Wade. The central figure is Charles Wheatstone (1802–1875), who was both the youngest and most instrumental of the London scientists involved in the experimental investigations of space and time in the early 19th century. The others are shown in clockwise chronological sequence from Thomas Young (1773–1829) at the top to Peter Mark Roget (1779–1869), John Ayrton Paris (1785–1856), Michael Faraday (1791–1867), Charles Babbage (1792–1871) and William Henry Fox Talbot (1800–1877). The major figures in this visual revolution are shown in Figure 2. The catalyst was Charles Wheatstone, who not only invented the stereoscope (in 1832) but also devised other ‘philosophical toys’ based on visual persistence. Nowadays, philosophy and toys seem strange bedfellows, but then the term was in common currency. Philosophy was associated with the study of nature, and what we now refer to as physics was called natural or experimental philosophy. Toys were simpler and rarer at that time, and they were sources of amusement or entertainment. Philosophical toys fulfilled the dual role of instruments for scientific experiment and devices for extending awareness of the senses. Wheatstone defined them as applying the principles of science to popular amusement, which also made them more memorable. Motion illusions were examined before spatial illusions took centre stage later in the century. Philosophical toys were applied to the perception of stereoscopic depth and to the apparent movement of a sequence of stationary pictures. The latter was based on visual persistence – the effects of a stimulus outlast its physical presence. Young used it to make the paths of rapidly vibrating strings visible. This led Paris, Roget, Faraday, Babbage and Talbot to find novel ways of exploiting persisting images. They are known for other contributions to knowledge: Roget for his Thesaurus, Faraday for his research on electromagnetism, Babbage for his computational difference engine, and Talbot for developing the negative/positive photographic process. Paris devised the thaumatrope or wonder-turner, which rendered two stimuli on opposite sides of a disc visible simultaneously when it was rotated rapidly. It was ridiculed by Babbage and Faraday, but it was phenomenally popular. Roget analysed the curved appearance of spokes when passing behind vertical railings. Faraday was attracted by Roget’s analysis of rotating spokes and by his own observation of counter-rotating cogwheels when visiting first a lead mill and then the Thames Tunnel with Brunel. When viewed so that one wheel was aligned with the other ‘there was immediately the distinct, though shadowy resemblance of cogs moving slowly in one direction’. He constructed a simple arrangement of cut-out sectored-discs to examine the effects further and wrote: ‘The eye has the power, as is well known, of retaining visual impressions for a sensible period of time; and in this way, recurring actions, made sufficiently near to each other, are perceptibly connected, and made to appear as a continuous impression.’ Talbot devised a disc for combining colours when rotating and established a relationship between apparent brightness and intermittency – the Talbot–Plateau law. Faraday’s work on visual motion stimulated Joseph Plateau (1801–1883) in Belgium, with his phenakistoscope or fantascope, and Simon Stampfer (1792–1864) in Austria, with his stroboscopic disc (both in 1833) to make similar instruments for presenting a series of slightly different still pictures in rapid succession – the first moving pictures. Stroboscopic discs presented stimuli discretely, briefly, and in succession; that is, a sequence of drawings differing slightly from one another were viewed successively through slits in a rotating disc. To the astonishment of observers, a single figure appeared in motion: perceived movement was synthesised from a sequence of still pictures. These instruments could be used by just one person at a time, whereas William Horner (1789–1837) from Bristol developed a variant for group viewing: it consisted of a cylinder mounted on a vertical axis, with slits at regular intervals, and a sequence of drawings on the opposite inside surface of the cylinder. He called it a dædaleum, but it became widely used in the latter half of the 19th century under the name of zoetrope. Another motion illusion was described in 1834 by Robert Addams (1789–1871), a peripatetic London lecturer aquainted with Wheatstone and Faraday. The waterfall illusion is a special case of the motion aftereffect and it was described after observing the Falls of Foyers in northern Scotland: ‘Having steadfastly looked for a few seconds at a particular part of the cascade, admiring the confluence and descussation of the currents forming the liquid drapery of waters, and then suddenly directed my eyes to the left, to observe the vertical face of the sombre age-worn rocks immediately contiguous to the water-fall, I saw the rocky face as if in motion upwards, and with an apparent velocity equal to that of the descending water.’ Thereafter instruments for generating motion were enlisted to investigate the phenomenon (Figure 3); they could be moved for a precise period and then stopped whereupon the previously moving part would appear to move in the opposite direction. Figure 3. Stimuli for investigating motion aftereffects. Left, a 19th-century chromolithograph of the Falls of Foyers; Addams would have observed the waterfall from the platform shown. Centre, an artificial waterfall. Upper right, Plateau’s spiral and lower right, a sectored disc. Ambiguity is a fundamental feature of visual representation, and artists have exploited it for centuries. For example, Roman geometrical mosaics display most of the principles associated with Gestalt grouping. Pictorial ambiguities were made explicit by many 18th-century artists, and the vase/faces motif was introduced around the turn of the century. Many ambiguities are dependent on the lost dimension of pictures – depth. They introduce uncertainly in our vision, and this uncertainty is evidenced in the fluctuations in apparent depth that ensue. Visual ambiguities offer alternative interpretations of the depth in drawings or alternative descriptions of objects defined by equivalent contours. A good example is the Necker cube, many variants of which were produced later in the century together with illustrations of ambiguity of interpretation (Figure 4). Wheatstone appreciated the significance of Necker’s observation and made a three-dimensional wire cube that also alternated in apparent depth. Another common example of perceptual reversal is that of a hollow mask, and this was described by David Brewster (1781–1868) in 1826. Brewster also observed conversions of relief with cameos and intaglios, which depended on the direction of the illuminating source. Necker corresponded with Brewster and described a perceptual alternation in a drawing of a crystal. Recognising radically different aspects of the same contours draws on more complex perceptual processes and they became popular later in the century. Figure 4. Upper left, Necker’s drawing from 1832; lower left, Beaunis cubes from 1876; centre, Gossip, a print showing women talking with one another in postures such that their clothing defines a satanic visage; it was produced in New York in the 1890s; right, the young girl/old woman figure as presented on a German postcard from 1888. The illusions that attracted the interests of many 19th-century visual scientists were those labelled ‘geometrical optical’ by Oppel in 1855 (see Wade et al, 2017). In addition to coining the term, Oppel described and displayed various illusions of orientation and size. These included line distortions due to intersecting angles as well as juxtaposed arcs, size distortions as a consequence of line intersections in triangles, rectangles and circles, as well as the influence of curved figures on size judgements. Geometrical optical illusions consist of relatively small but reliable distortions of visual space, mostly in the domains of size or orientation (Figure 5). Many novel forms were devised and depicted in the final decades of the century, and they often bear the names of those who first drew and described them. Figure 5. Geometrical optical illusions of size and orientation. All the horizontal lines are equal in length and parallel, as they so appear in the centre. Both these features can be manipulated visually by adding fins (left) or tilted lines (right). Many attempts have been made to classify illusions in a manner that will facilitate interpreting them. Vicario (2011) listed 26 different classifications! Perhaps the simplest is the one proposed by Boring (1942): direction, orientation and the rest. The common factors of the classifications are: direction (orientation), size, contrast, assimilation and perspective. Some systems are concerned with the distorted dimensions (like size and orientation), others involve possible underlying processes (like assimilation and contrast, and eye movements), and yet others characterise the levels at which the illusions should be considered (like physical, physiological and psychological). The new geometrical optical illusions were interpreted according to the visual theories of the day. However, prior to the explosion of experimental inquiries in the late 19th century a lucid classification and interpretation of illusions was provided by Roget. The three classes of illusions he presented – optical, internal and mental – are similar to those that are applied in contemporary visual science of physical, physiological and psychological (Gregory, 2009). Different approaches have been made to the interpretations of illusions in Roget’s three categories. Illusions in the first class are generally interpreted in terms of geometrical optics. Interpretations of those in the second class have had some success with regard to the burgeoning knowledge of neural processing. Most attention is now directed at those of the third class, for which there are competing theories. Geometrical optical illusions are quintessentially phenomena of the late 19th century, when the likes of Helmholtz, Hering, Mach, Müller-Lyer, Poggendorff and Zöllner described their eponymous phenomena. These illusions have an important place in the history of psychology, because they were amongst the factors that led Wundt to establish his Psychological Institute at Leipzig in 1879 – he could not envisage how illusions could be accounted for in physiological terms, and so they, along with consciousness, required a separate discipline. Wundt took as his yardstick the proximal stimulus (the retinal image) – and he could not accept that, say, two linear extents that produced equivalent retinal extents could yield perceptual inequality due to physiological processes. 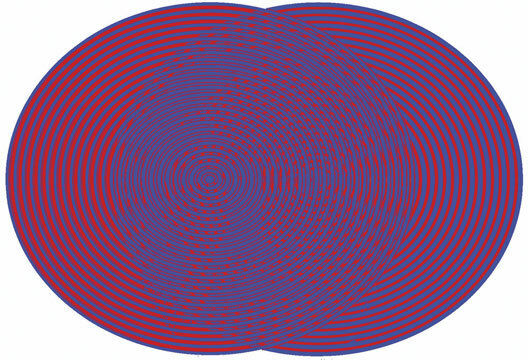 Thus, geometrical optical illusions are important in the context of establishing psychology as an independent discipline: there was considered to be no physiological correlate of perception. Why should there have been this burst of illusory activity in the late 19th century? Why did outline drawings assume such a central role in the study of vision? It could have been due to the combination of two powerful strands of thinking about vision. The first stems from the 17th century, when the dioptrical properties of the eye were elucidated, thereby setting in train the idea that vision has as its starting point the static retinal image. The problem was seen as restoring the missing dimension of distance. The second strand relates to the experimental approaches to the study of perception introduced in the mid-19th century. Wheatstone and Helmholtz argued that experimental rigour of the physical sciences should be brought to bear on the study of vision. Thus, stimulus variables should be isolated and manipulated in quite unnatural ways in order to determine how perception is modified. It is difficult to manipulate solid objects, but it is exceedingly easy to create novel pictures. Moreover, Wheatstone himself had shown that the perception of three-dimensional space can be synthesised from the use of two appropriate flat drawings. So pictures became the accepted stimuli for the study of vision. Once accepted, the psychologists then rediscovered tricks that had been a part of the artist’s armoury for centuries, and they devised some novel ones too. Illusions remain a potent source of visual stimulation – see the myriad manipulations illustrated in The Oxford Compendium of Visual Illusions. However, in my eyes, the 19th century remains the golden era of illusions (Figure 6). Purkinje’s promise has yet to be realised; perhaps visual truths will reveal visual illusions rather than the reverse. Figure 6. Age of illusions by Nicholas Wade. Portraits of pioneers of illusions are embedded in the figures with which they are associated. The central portrait is of Johann Joseph Oppel (1815–1894) in one of his illusion figures. The other portraits are (clockwise from the top in chronological sequence): Roget; Louis Albert Necker (1786–1861); Purkinjě; Johann Christian Poggendorff (1796–1877); Plateau; Hermann Ludwig Ferdinand von Helmholtz (1821–1894); Wilhelm Maximilian Wundt (1832–1920); Karl Ewald Konstantin Hering (1834–1918); Johann Karl Friedrich Zöllner (1834–1882); Ernst Mach (1838–1916); Franz Carl Müller-Lyer (1857–1916); and Mario Ponzo (1882–1960). See also Richard Wiseman's review of The Oxford Compendium of Visual Illusions. Boring, E.G. (1942). Sensation and perception in the history of experimental psychology. New York: Appleton-Century. Gregory, R.L. (2009). Seeing through illusions. Oxford: Oxford University Press. Shapiro, A.G. & Todorović, D. (Eds.)(2017). The Oxford compendium of visual illusions. New York: Oxford University Press. Vicario, G.B. (2011). Illusioni ottico-geometriche. Una rassegna di problemi. Venice: Istituto Veneto di Scienze, Lettere ed Arte. Wade, N. (1990). Visual allusions: pictures of perception. Hove: Erlbaum. (Reprinted in 2017 by London: Routledge). Wade, N. (2016). Art and illusionists. Heidelberg: Springer. Wade, N.J. (2017). Early history of illusions. In A. Shapiro and D. Todorović (Eds.) Oxford compendium of visual illusions. Oxford: Oxford University Press. pp. 3-37. Wade, N.J., Todorovic, D., Phillips, D., & Lingelbach, B. (2017). Johann Joseph Oppel (1855) on geometrical-optical illusions: A translation and commentary.